A Gavop study of the top ten refinance mortgage lenders in Las Vegas revealed that Quicken Loans Inclusive is at the top of list with the highest approval rate of 70.37% in 2017. One Nevada Credit Union is at number 2, with an approval rate of 60.98%. Loandepot.com follows at number 3 with 59.91%. U.S Bank National Association and Nationstar Mortgage are at the 9th and 10th spot with approval rates of 31.16% and 28.34% respectively. Gavop collected data for this study from the latest Home Disclosure Mortgage Act (HMDA). In the last one year, Quicken Loans Inclusive—although ranked number one—saw a 9% decrease from its 2016 approval rate of 79.43%. Between 2016 and 2015, its approval rate increased minimally by about 2%. Ranked number 2, One Nevada Credit Union’s approval rates fell drastically by 20%, from 80.79% in 2016 to 60.98% in 2017. In the previous year, the lender registered a small increase of 4%. Loandepot.com, at number 3, showed the most remarkable increase in approval rates by around 47%, from 13.43% in 2016 to 59.91% in 2017, and a 9% decrease from 2015 to 2016. 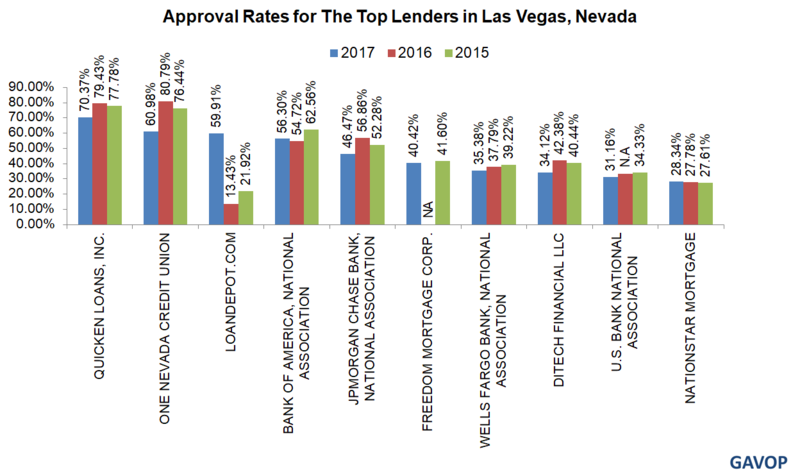 The following graph compares the approval rates for the top 10 refinance mortgage lenders in Las Vegas. The study also compared approval rates at the city and state level. The city of Las Vegas has reported a refinance mortgage approval rate of 44.16% in 2017. It is almost on par with the statewide figure of 45.97% for the same year in Nevada. Between the years 2015 and 2017, Las Vegas has shown a slight decrease of 2.3% in approval rates, from 46.43% in 2015. In the same period, the decrease of approval rates for the state of Nevada is almost the same, at a 2.5% from 48.48% in 2015. The table below shows the top 10 refinance mortgage lenders by approval rates in the last 3 years, for Las Vegas. For more details & data on Las vegas, NV Mortgage Lenders, click on this link.